There appears to be two types of Panormo guitar, with very different labels . 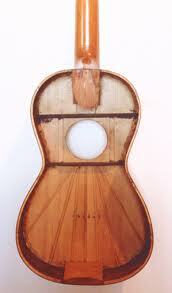 One label reads “Panormo Fecit” while the other reads “Louis Panormo, The only maker of Guitars in the Spanish Style”. The “Panormo Fecit” guitars are smaller and have cross bracing on the soundboard, while the “Only Maker” style guitars are larger and have some type of fan bracing. This entry was posted in Historical research and tagged history panormo luthier, romantic guitar spanish guitar history. Bookmark the permalink.